In order to successfully run Industrial on your website your server environment will have to meet certain PHP and WordPress minimal version requirements. Industrial requires php 5.4.X or higher installed on your server. If you do not have WordPress installed check php version without WordPress instance. If neither of these options work for you, please consult your hosting provider regarding the php version you are running on your server. You can have a closer look at how to increase the PHP memory by referring to the following article: Fix WordPress memory exhausted error increase php memory. Although the theme will run on older versions of WordPress we highly recommend WordPress 4.4.X or later. In order to check which version you are running, please click on the WordPress icon in the upper left corner of your wp-admin console. If you’ve recently purchased a hosting plan and a domain name, the next step is to install WordPress CMS on your server. The best option is to start with fresh WordPress installation. 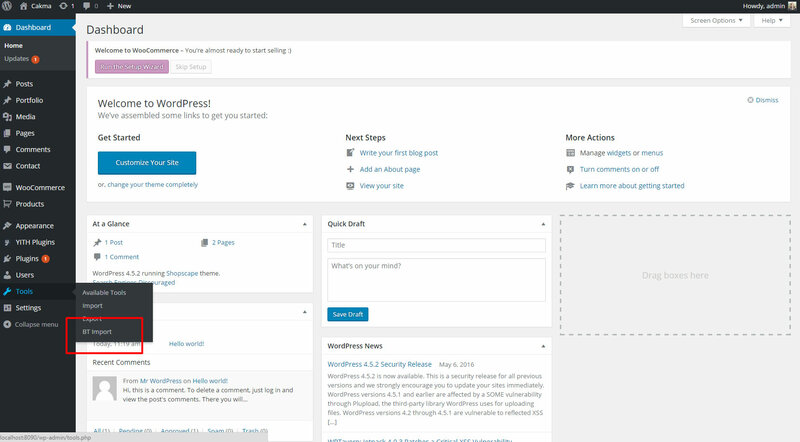 A step by step guide: How to install WordPress. If you plan on using our theme on a local WordPress development and migrating your site live later on, this is a useful link that shows how to create a local WordPress development environment: Installing WordPress on a Local Server Environment. If you’re switching to a new domain please refer to the following link to make sure that all the necessary steps are taken: How to Properly Move WordPress to a New Domain Without Losing SEO. Reach out to the worldwide WordPress community. All files and documentation package contains all files provided with the theme, including this document. Installable WordPress file only should be used in the process of Theme installation. There are two methods of installing a theme onto your WordPress site. 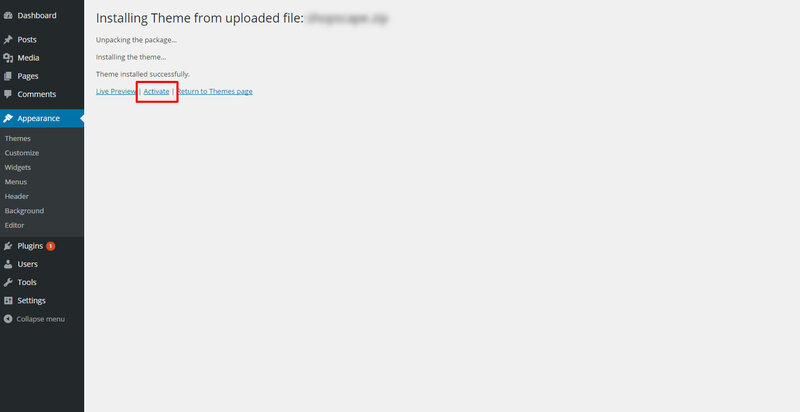 You can use the WordPress Admin panel to upload and install the theme, or you can use FTP software instead. Click Install Now and the installation will begin. You can monitor the installation process in the lower left corner of your browser. 9. 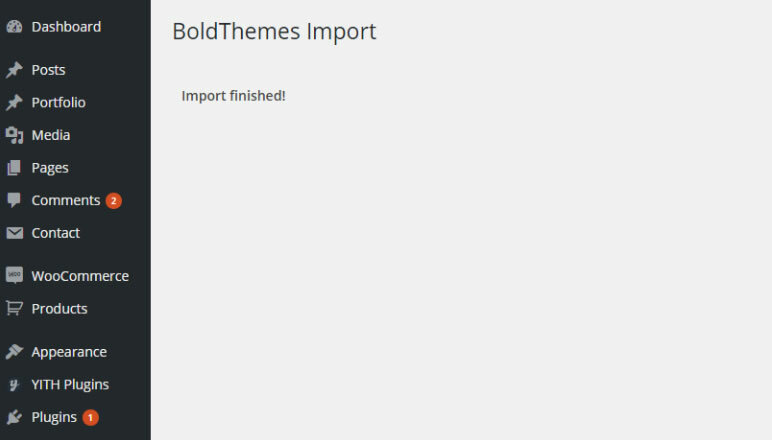 You should see the list of themes installed in your WordPress instance with the Industrial activated. Congratulations! You’ve successfully installed and activated Industrial WordPress Theme on your website. Proceed to install plugins and either add your own content or import the demo content to get your site up and running in no time. To install the theme using FTP software, log in to the server where your WordPress website is hosted. First extract the “industrial” folder from Installable WordPress file only package that you received in your installation pack. Now connect to your server via FTP and navigate to the /wp-content/themes/ directory under your WordPress website’s root location. Upload the industrial folder to the themes folder on your remote server. Once the theme is uploaded, you need to activate it. Go to ‘Appearance > Themes’, find Industrial and click ‘Activate’ button. Once you have WordPress and the theme installed, you’re required to install the necessary plugins to successfully run our theme on your website (Bold Page Builder, theme’s plugin and the rest). Upon installing and activating theme in Appearance > Themes panel you will get a notice at the top of your admin panel saying that the theme requires certain plugins. Click on Begin installing plugins. Once the installation is complete the following screen will appear. Click Return to the Dashboard at the bottom of the screen. Note: WooCommerce is recommended plugin. We strongly encourage you to install it even if you do not intend to use it since demo with WooCommerce assets can be imported only if this plugins is installed and activated. Once you import the demo, you can deactivate and uninstall it. The best way to start is to install demo content. If you want to install demo content please go to next section – Installing Demo Content. The best practice is to start with fresh WordPress installation or use WordPress Database Reset plugin to clear your WordPress instance of previously existing content. 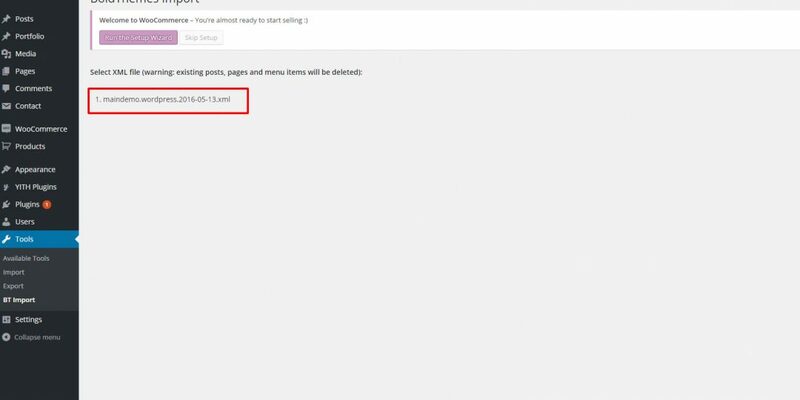 Import of demo content will delete all existing posts, pages and menus. *Note that if you are using WordPress Database Reset plugin you should not click on ‘Select All’ option, as that will delete your user and you’ll be locked out of your site. You only need to remove content you previously added, such as pages, posts, images, etc. Note: Since main demo contains WooCommerce demo data and Visualizer: Charts and Graphs Lite as well, please make sure to install and activate them prior to activating the import or the import will fail. If you do not intend to use WooCommerce or Visualizer: Charts and Graphs Lite, feel free to deactivate them and uninstall them later on, but it has to be activated prior to import. 3. Select demo XML which you want to install and click on it (warning: existing posts, pages and menu items will be deleted). 4. Please wait until you get the message that import is finished. 5. If you imported demo with WooCommerce content, go to WooCommerce > Settings > Products > General and select Shop as Shop Page; then go to Advanced >Page setup and select Cart as Cart Page, Checkout as Checkout Page, and My Account as My Account Page. Congratulations! You have successfully imported the demo. 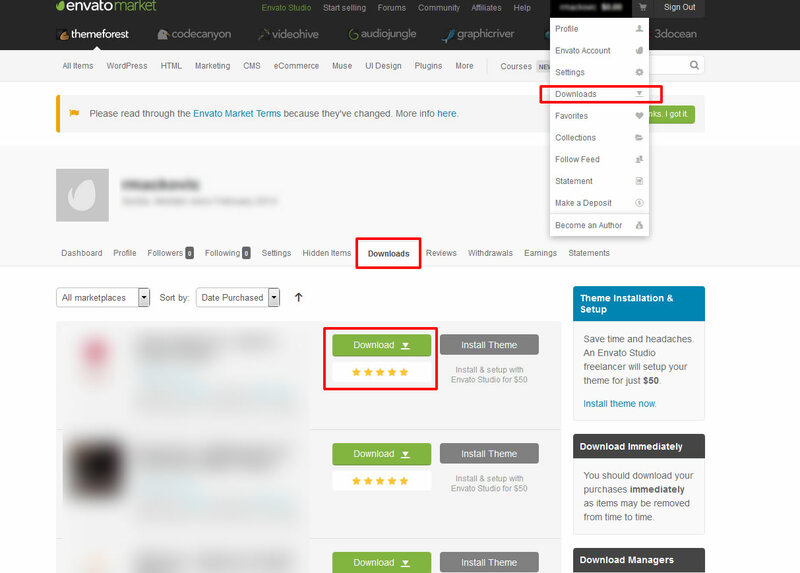 If you click on visit Site in wp-admin header, you should see your site with demo content imported. In this section we will describe the most common errors that can occur when installing the theme, and provide solutions for each one. An error message while installing or activating a WordPress theme usually means that the incorrect file(s) were uploaded. The exact error message may vary, however it will typically include the words, ‘Broken Theme’ or ‘Stylesheet Missing’. A similar message will appear if you’re using a plugin that has minified all the CSS files, including the theme’s or child theme’s default style.css file, which should be left intact according to WordPress regulations. The solution is to review which file you were uploading – please refer to section Installing Industrial Theme for instructions which files to use in the process. This issue is most commonly related to either php version (required php version is 5.4.X or higher) on your server or WordPress memory limit and its value being too low on your server. Please read this article and increase the WP memory limit: Fix: WordPress Memory Exhausted Error – Increase PHP Memory. Save the file, re-upload it back to your server and check for issues. Parse error: syntax error, unexpected T_STRING in /wp-content/themes/eventim/php/BTCrushFunctions.php on line 7. Keep in mind that this issue is most commonly related to php version (required php version is 5.4.X or higher). You need to update your php version to the required one. Parse error: syntax error, unexpected T_FUNCTION in /wp-content/themes/medicare/functions.php on line 39. In this section we will describe the most common errors that can occur when importing the demo, and provide solutions for each one. Error. This demo contains WooCommerce data. Please install and activate WooCommerce. I got the red colored Internal Server Error Message. What should I do? I get Error 404 (Page not found) for all pages except the home page of the site. What should I do? Images on my demo site are low quality. Why is that? As it was mentioned in 2.5 Installing Demo Content section, some of the demo contains WooCommerce demo data, which is why WooCommerce should be installed and activated. Navigate to Plugins > Add New and in Search plugins field type WooCommerce (author WooThemes). Install it, activate it and then continue importing demo content. On some hosting environments (HostGator, GoDaddy) there is an issue with the resources dedicated to a single instance of Shared Hosting. While trying to prevent a single instance to compromise others in Shared Hosting environment, they set the limits too low. Especially limits related to memory and processing power. As a first step, please try to set Server Recommended Settings and try the import again. If that does not work, most probably the hosting limit prevents creation of thumbnails for images larger than 60-70k. The consequence is that you will not be able to see the thumbnails in your Media Library although the images are there (thumbnail was not created) and you will not get optimized images for different elements on the site. You will get the original ones which are usually not optimized for the placeholder they have been put in. In order to import the demo in such environment, you need to repeat it over and over again. The import is incremental process and eventually it will finish (it usually takes 30 or more retries since it will crash on the import of each image larger than 60kb). You can check the progress by refreshing Media Library window – each retry should add one or more images (the ones with 60kb and more will be grey while the smaller ones will have a proper thumbnail). Once the import finishes you will have a functioning demo, but we strongly recommend to resolve the resources issue with the hosting or change it since it will almost certainly create other problems in the future. Try to recreate permalink structure by going to Settings > Permalinks, changing it to Post name for example, saving the settings, then changing it back to Day and name and saving it again. Demo imports come with low quality images for two reasons – one is the speed of import and the second is that images are not licensed for third party use, just for demo presentation purposes. Distributing production quality images with our demos would be a violation of the license terms on our part. If you would like to use the same images as on our demo for your final site, please let us know and we will provide you all the information of used images on ShutterStock.